Timotheus Ioannes Berners-Lee (Timothy John, usitate Tim Berners-Lee; natus die 8 Iunii 1955), est mathematicus Anglicus qui Telam Totius Terrae apud CERN die 12 Martii mense Martio 1989 primus invenit. Alumnus Universitatis Oxoniensis, Regalis Societatis Londiniensis socius, Lexingtoniae in Massachusetta incola, ipse in Massachusettensi Technologiae Instituto operam dat. Quod hypertextum et Telam totius terrae inventus est, anno 2016 Praemium Turing accepit. Gaines, Ann. 2001. Tim Berners-Lee and the Development of the World Wide Web. Mitchell Lane Publishers. ISBN 1-58415-096-3. Stewart, Melissa. 2001. 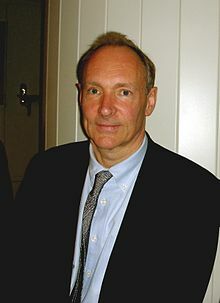 Tim Berners-Lee: Inventor of the World Wide Web. Ferguson Publishing Company. ISBN 0-89434-367-X [liber iuvenibus destinatus]. Fischetti, Mark. 1999. Weaving the Web. Harper Collins Publishers. ISBN 0-06-251586-1, 0-06251587X. Cailliau, Robert, et James Gillies. 2000. How the Web was Born: The Story of the World Wide Web. Oxford University Press. ISBN 0192862073. Novissima mutatio die 12 Martii 2019 hora 15:35 facta.